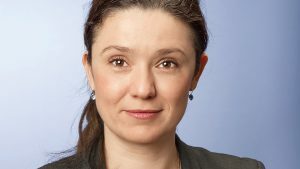 Petia Niederländer studied investment banking and corporate management at the Vienna University of Economics and Business and spent part of her studies in Australia. The Bulgarian has been living in Austria for 20 years and has been working in the Erste Group since 2009. She has been Head of Retail & Corporate Operations since April 2013 and is responsible for the clearing and international business relationships of Erste Group. We talked to her about Erste Group’s blockchain technology strategy. Dutch gives us a deep insight into the competition of the different technological approaches of IBM, SWIFT, R3 and Ripple. One thing, however, seems certain: In the banking world, distributed ledger technology is creating a new back-end system that could go into a new type of payment transaction. The Erste Group was so far covered with statements about Bitcoin and Co. very. How do your institute assess the topic? Petia Dutch: We are basically not involved there. Our efforts on blockchain technology are aimed at finding out in which sectors we expect the greatest disruption in the future. Above all, we monitor cross-border trade between banks and try to create more efficient systems for our corporate clients. Despite the gigantic hype around Bitcoin, the retail customers of the banks get little of the technological innovations. The blockchain is a backend technology. It brings great benefits to participants in a common ecosystem. For our small and medium-sized customers, we have launched the Batavia platform, a first pilot that portrays the financing of export and import business in a novel way ( Trending Topics reported). If, for example, a restaurant buys coffee, drinks or food from other countries that we want to finance on short notice, it often gives you weeks of waiting time. Importer and exporter know and do not trust each other. Customs offices and border controls create a complicated process with many stamps and more paper. With Batavia, we are relocating the processing of the services associated with the import to a blockchain. All involved parties know where the goods are, what status they currently hold. Blockchain also guarantees the payment of goods by our bank. How much time do companies save? The speed depends on the destination country. Within Europe, we are now able to conclude an import contract including the financing guarantee within a few hours. It used to be days, if not weeks. Currently we use Batavia for customers from the USA and Europe. However, the new methodology, with its strong partner network (UBS, Caixa Bank, Bank of Montreal and Commerzbank), certainly has the goal of acting globally. Batavia is based on Hyperledger from IBM. Do you currently see a competition between the individual distributed ledger technologies? Definitely. Especially in the finance sector, there are a wide variety of players who pursue a similar goal – to make interbank trading more efficient and to radically shorten transaction times. IBM brings in hyperledgers in a variety of consortia. SWIFT is also working on its own proof-of-concept to map banks’ liquidity in real time. The organization is responsible for the transaction traffic for more than 10,000 banks and thus the user group is of course enormous. However, it may take years for SWIFT to launch its own blockchain technology. Ripple currently has a lead. It is quite possible that the startup will bring more mass-compatible technology to market faster. How will Distributed Ledger affect the banking world? Before our eyes, a new Internet is being created that links the different distributed ledger approaches, creating a new digital world in which the logs of each distributed record communicate with each other. Transactions happen in real time, costs are radically reduced. Which other pilots did Erste Group launch? We have been working with Ripple since 2016 and have developed a pilot for foreign payments. Anyone wishing to transfer money abroad in a foreign currency will experience this in the future without waiting. We have installed a top institute in the holding company. There is also our clearing bank. The pilot tries to link our subsidiary banks together to realize international transactions without conversions. If it works within the group, then it can also work with international partners. Once opened, we can look for suitable partner banks from the ripple network we work with. When should the network be opened to other institutes? We finished the pilot at the end of 2017. We are now evaluating further technological approaches and waiting for the efforts of Swift and Hyperledger. We want to find the right partner in peace and quiet. By the end of the year will we have a decision to meet . How did the collaboration with Ripple work? The interaction of startup and bank is often characterized by cultural differences. The ripple technology is technologically advanced, and the implementation into our own legacy was actually the biggest challenge. Ripple is developing a payment system that is controlled by users. This is difficult to reconcile with the learned tradition of a bank that has so far steered everything centrally. In addition, there were problems in the early stages of the process because Ripple was focused only on the US market. Therefore, the implementation of the pilot took over twelve months? We simply did not understand at the beginning. Ripple was only active in the US. But that changed in 2017. Brad Garlinghouse and his team have begun to serve European banks regionally, and have stationed many experts in London who act as direct contacts for us. That’s why the technical implementation took so long. Afterwards we tested the performance and business functionality and integrated a payment backend. Many other banks rely on the R3 consortium to develop their own centralized solution. Why is R3 not suitable for Erste Group? R3 wants to develop its own Distributed Ledger as an alternative to Blockchain. We looked at the conditions, conducted discussions and found that there were no suitable use cases for us. We want to actively shape the development and therefore need to find out well in which consortia our experts contribute and in which not. R3 wants to cover many areas, but we want to be actively integrated into the workflow. We chose ripple because the ledger was better and the experiments seemed more exciting. The partner network also played an important role. We are looking for cooperation banks that have the same target markets. Interbank trade, import business – which areas are exciting for the finance sector? Of course, the colleagues from the capital market are intensively observing the topic. However, we must wait for the regulatory action and look at what laws will be implemented during the year. The KYC process, Identity Management, is also really interesting. For the review of customer data, we also expect a technological quantum leap in the coming years.